Congratulations Chennai Super Kings and well played Sunrisers Hyderabad. Here are some quick takeaways from the super charged final of IPL 2018. 1. Face the tough times:Watson had been resilient in these situations like the final twice - today with the calm Bhuvaneshwar Kumar and with the instigating charged up Wahab. In both situations, he maintained his composure, didn't let the situations dictate his moods or actions and came out as winner. Just like this, Each of us will have many tough things we have to go through in life, work, relationships and there are no two ways about it. The best way when nothing is working your way is to hold your head high and absorb everything happening around you and make that as your experience. What makes leaders differ from others is that they are always thinking about strategies and have a plan to back up if things don't work out and always keep improvising and put things they planned in to execution. Keep thinking on your feet, all the time. When Watson had 9 dot balls on his score card, he wasn't thinking about the match or the bowler, he was focusing on how he can start going back to run a ball and then accelerate. Be in the how and hold your peace. 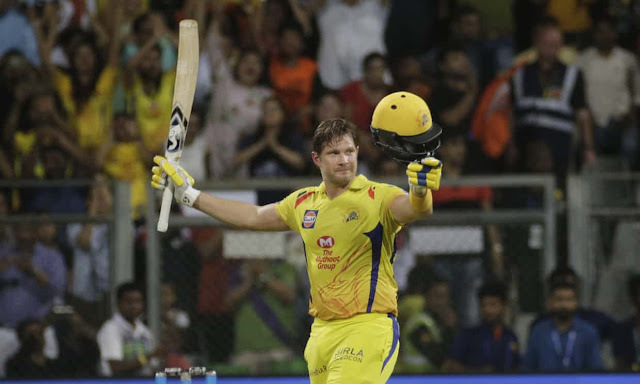 Believe in yourself and your team:While things weren't going well, Watson got enough support from Raina, Bravo and team in the dugout who didn't have a tense moment as they believed he would come up with a cool knock. You could see Dhoni in the dressing room keeping his cool and pacing calmly. Believe and depend on your team to help you get out of tough situations and be there when someone is not doing well. You need to back your team and work together. Working as a team and focusing on the enemy will help everyone move forward. Training and process pays:Did you observe Shane Watson was not able run singles? His lower body wasn't helping him and he decided not to push himself in running singles and strategically played to score 4s & 6s. This applies to our business and life too. When you know you aren't going well in any area, play to your strengths and recuperate where you are down. Simple logic but very useful. If one of your products isn't doing well, focus on the better moving ones and help rework on what is not working. Having the best training where you can see all possible scenarios and work on them before going to the field. While it is important to win, it is not everything. Going there in tune with your value systems, trust, respect makes it as important. Williamson proved this just right. Thrust upon the responsibility to captain a team who lost their leader in an ugly scandal, he evolved into one of the top leaders easily this IPL. Dhoni has his share of points in this as well. He could come back after a gap, regroup and live up to the tremendous pressure of the fans, management and himself. In business world we need to always remember the values you have for yourself and your team. Respect, trust and honesty are virtues you need to live for and this will be with you even after you have moved on with the situation you are handling. Seeing visuals of Dhoni carrying is daughter, Sakshi, Anushka and lot of family support in the ground actually helps show how important it is for the players and the fans. Spending time with the family and sharing your thoughts with the experiences help your reduce stress. Giving equal importance to the family helps you think clearer and be peaceful. Make time for the family. Several players in CSK are over 30 and no one seemed slow or easy to go. This shows the amount of importance given to physical fitness and mental strength they have. Dhoni is as for as ever. Time to bit the gym and lose those extra pounds and get fit. Being fit helps you take things to a different level. What is your takeaway from today's game? Share in the comment below!